This time of year, we love to use one of our favorite autumn ingredients: pumpkin. You know, the big orange squash people use to make pumpkin pie. But man (and woman) cannot live by pie alone. We also need ice cream! Which reminds us: A while back, we discovered a way to make ice cream without churning—and using no special equipment except our trusty stand mixer. It’s a quick and easy method that produces better ice cream than anything you’re likely to buy in a carton. So of course, we couldn’t resist adapting it to make this terrific tasting No-Churn Pumpkin Spice Ice Cream. Just in time for Halloween. Boo! This recipe follows the same basic technique we used in making No-Churn Cherry Ice Cream with Chocolate. The recipe is cream-rich, so it’s not diet food. But it’s so luscious, you’ll probably be satisfied with a smaller amount than you usually eat. It also uses sweetened condensed milk, which is just regular milk with much of the water removed and sweetener added. Milk and sugar are common ingredients in ice cream making, so using sweetened condensed milk is a quick way to mainline those ingredients into your ice cream base. This recipe requires you to whip cream, which is easiest to do if you have a stand mixer. A hand mixer will work, but it takes longer. After you mix the ice cream, you’ll need to freeze it for several hours to develop proper consistency. Mrs. Kitchen Riffs makes most of the sweets at our house, and this recipe is her creation. She adapted it from a recipe she found in 100+ Luscious Ice Creams without a Machine, an e-book by Suzy Bowler. This recipe takes only about 20 minutes of hands-on time. But it requires you to cook a pumpkin mixture—and that will need to cool for an hour or more before you add it to the whipped cream. Then you’ll need to freeze the ice cream for at least 4 hours (maybe more, depending on your freezer temperature). BTW, you can cook the pumpkin mixture ahead of time and refrigerate it until you’re ready to mix it into the ice cream. This recipe yields about one quart, though it can easily be scaled up or down. Place the pumpkin purée in the bowl of a stand mixer (or in a large bowl, if using a hand mixer). Add the brown sugar and mix in. Then add the cinnamon, ginger, cloves, and salt. Mix until all ingredients are well combined. Place the pumpkin mixture in a microwave-safe container and microwave on high for 60- to 90-second intervals until the mixture reaches a temperature of about 180 degrees F (we use an instant-read thermometer to test). Stir the mixture after each cooking interval (but be careful, the container can get very hot). Remove the cooked pumpkin mixture from the microwave and add the maple syrup. Stir well to combine. Let the mixture cool to room temperature (cover the container with a lid or plastic wrap while cooling). Once the pumpkin mixture has cooled sufficiently, whip the cream: In the bowl of a stand mixer, using the whisk attachment (or in a large bowl, using a hand mixer), whip the cream until it forms stiff peaks (i.e., ones that hold their shape when you lift out the whisk). Add the cooled pumpkin mixture to the whipped cream and fold it in gently. Add the sweetened condensed milk to the mixture (start with 3 ounces, then taste; if you’d like more sweetness, add another ounce; see Notes). Fold all the ingredients together until they are well mixed. Pour the mixture into a shallow one-quart container (see Notes) and cover tightly with a lid. Freeze the ice cream until it sets firmly (at least 4 hours in our freezer, though your timing may vary). When ready to serve, scoop the ice cream and garnish with a cinnamon stick or a dusting of freshly ground nutmeg, if desired. 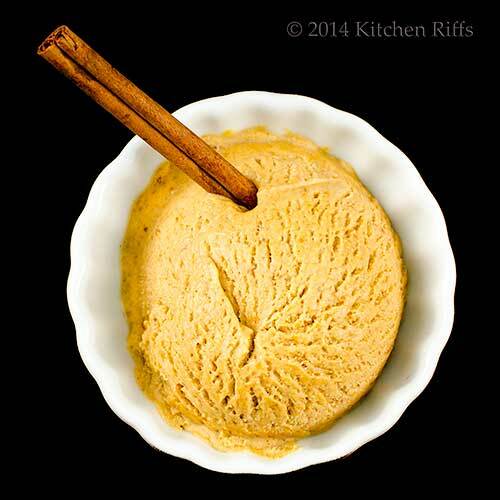 You can make this ice cream without microwaving the pumpkin (Step 2), but cooking with spices greatly enhances its flavor. If you don’t want to microwave the pumpkin, you could try roasting it in the oven (we haven’t cooked it that way for this dish, but suspect it would work fine). Sweetened condensed milk tends to be very, well, sweet. We suggest that you start by adding 3 ounces, then taste the mixture. If you want more sweetness, fold in another ounce. In the US, sweetened condensed milk generally is sold in 14-ounce containers. So if you open a new can and have some left over after making this dish, just pour the remaining milk into an airtight container and store it in the fridge. It will keep for at least a week, and probably longer. Kosher salt is more coarse than regular table salt, so it’s less salty by volume. If you’re substituting table salt for Kosher, always use less—about half as much. You should use real maple syrup in this recipe. If the bottle doesn’t say “pure,” it’s not 100% maple syrup. Most “breakfast” or “pancake” syrups contain only a bit of maple syrup; the rest is flavoring and other sweeteners. You can freeze this ice cream in a container of any shape, though we find that shallow ones work best. They allow the mixture to freeze more quickly, which helps the ice cream maintain a smooth, creamy texture. Shallow plastic quart-sized containers work well. If you want “pie crust” in this ice cream, you might try adding some ground-up graham crackers or finely chopped nuts (we’d opt for pecans) in Step 5. We haven’t tried this, but like the idea. On another matter entirely: A big thanks to Charlie Louie who writes the terrific blog, Hotly Spiced. She’s doing a series in which she visits some of the blogs she reads regularly, reproducing a recipe from each of them. We’re delighted (and flattered) that, in this post, she’s visiting Kitchen Riffs. She makes our Easy Pickled Watermelon Rind—and you really need to visit her blog to see what a wonderful job she did with it. Thanks so much for your great post, Charlie! “Thanks, that was the idea,” said Mrs. Kitchen Riffs. “It’s perfect for Halloween,” I said. “And Thanksgiving,” added Mrs K R.
“Easy as pie,” said Mrs K R.
Ahhh ... lovely! I remember the first no-churn ice cream recipe, how sweet that it works. And I love-love-love that the very first “note” answered my very first question, Why it was necessary to heat the pumpkin. Thanks for thoroughness! I always learn something here! Hi Alanna, when we first made this ice cream, we didn't heat the pumpkin -- and although it was good, it wasn't "wow." So we thought heating the pumpkin would help intensify the flavor, and it does. Thanks such a nice comment. John, this is so easy to make... I was waiting for a sale on ice cream makers to buy one. Now I guess I have no excuse to spend more money buying a machine OR buying ice cream anymore :). Thanks for a lovely recipe. BTW: Thanks for being there during the hard time I've been through. It really meant a lot to me knowing that I have such supporting fellow bloggers and friends. I appreciate it. You read my mind, I was planning on making pumpkin ice cream for the fall. This looks awesome!! Hi Nee, this really is a terrific recipe -- and loads of flavor! We eat ice cream year round too. :-) Thanks for the comment. Hi Pat, I think a lot of us are trying to lose 10 pounds! And this dish doesn't help that. But it's so worth it. :-) Thanks for the comment. Hi Amira, good to see you again! And although an ice cream machine is nice, I think this method makes better ice cream. And it's easy! Thanks for the comment. Hi Shibi, this really is a great ice cream -- pumpkin works much better in ice cream than I would have thought. And it really does taste like pie! Thanks for the comment. Several years ago, having arrived in Michigan without a part for my ice cream machine, I learned how to make ice cream with a stand mixer. It works, John, and you're right. It's far better than anything you can buy at a store. Your pumpkin ice cream sounds like the real deal, full of pumpkin pie flavor. Great idea, too, heating the pumpkin and spices to improve the flavor. I've used seasoned graham crackers in ice cream and it really does make the ice cream taste more pie-like. This recipe has all its bases covered and sounds great! Thanks, John. WOWZER is right! I'm salivating right now! I know for a fact that we would enjoy this ice cream over pumpkin pie any day of the week! We both love the taste of pumpkin pie but not the texture so this ice cream would solve that problem. Thank you Mrs. KR for sharing this recipe!! This sounds so so much better than store bought ice cream - love all that cinnamon and ginger and cloves in it - in fact - it sounds like it just might be tastier than pumpkin pie!!! Thanks so much for sharing this one! Hi John, isn't it fun to make no-churn ice cream? I really like it better than the machine-made stuff. And cooking the pumpkin is a real improvement -- worth doing. Thanks for the comment. Hi MJ, this is a wonderful dish -- I'll bet you and Bobby would really enjoy it. All the flavor of pumpkin pie with all the texture of ice cream. Win win. :-) Thanks for the comment. Hi Shashi, this really might be tastier than pumpkin pie! Certainly tastier than any store-bought pumpkin pie (although the pie we make rivals this in flavor). Thanks for the comment. Hi Dottie, you'll really enjoy Charlie's blog -- she's terrific! And you'll love this ice cream too. It's terrific! :-) Thanks for the comment. OK, I might finally be ready for pumpkin...even though it is still in the 70's here (and no, NOT complaining). So I'm wondering if I didn't whip the whipped cream if I could then churn the mixture? Just wondering out of curiosity but I do love using my ice cream maker! Looks like Mrs. K.R. is up to creating magic in the kitchen once again, just in time for Halloween I might add. As you know I have been watching my calories also but, Marion is not! I'm going to save this recipe and technique just in case. She really love this pumpkin time of the year and the thought of making her Pumpkin Spice Ice Cream would be all the calories I need. Hi Barb, don't know whether churning this ice cream would work, although I can't see why it wouldn't. Definitely worth a try! Thanks for the comment. Hi Louise, this dish definitely has more than a few calories! Although the good news is it's so rich, you really can eat only a little bit at a time. That's my story, and I'm sticking to it! :-) Thanks for the comment. I have made the statement that I am not a pumpkin fan, but after making pumpkin ice cream I have had to retract my statement. I made half vanilla and half pumpkin. The pumpkin was the first to go. Your photos make it even more tempting. I love, love pumpkin ice cream, John! Your version looks delicious and even better since it's no churn! Boo! Love that this is a no churn ice cream. The color is just perfect. Kudos to Mrs. K.R.! Hi Madonna, pumpkin just works in ice cream, doesn't it? I love it! Thanks for the comment. Hi Amy, Boo! :-) No-churn really rocks -- it's so easy! Thanks for hte comment. Hi Charlie, I was delighted to be featured in that very kind post of yours! And this is pretty creamy -- the pumpkin helps with the texture in that regard. Thanks for the comment. Hi Liz, the texture on this was perfect for scooping! And you really should try no-churn ice cream -- it's a revelation. Thanks for the comment. Hi Cheri, Mrs KR did good, didn't she? ;-) And no churn ice cream rocks! Thanks for the comment. Hi Juliana, this really is a great ice cream -- lovely flavor and texture. Thanks for the comment. This recipe sounds sooo good! Great idea of using brown sugar for flavor, so easy to make, too! I could go for a bowl right now. 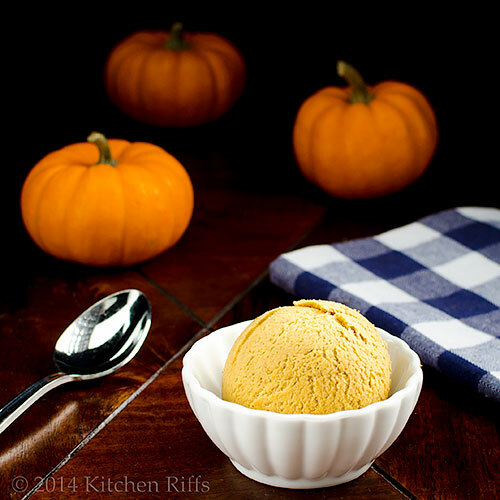 I have never tried pumpkin ice cream - yours looks so delicious and perfect! Yum! I bet if you served it with biscuits it would taste like pumpkin pie! Hi Mireya, both the brown sugar and the maple syrup add a lot of flavor to this dish. It's really good! :-) Thanks for the comment. Hi GiGI, lol! We actually thought about allspice, but decided it was spicy enough as we made it. But allspice could be awesome in this. :-) Thanks for the comment. Hi Julia, pumpkin ice cream sounds a bit odd, but it so works. Really good stuff. Thanks for the comment. Hi La Torontoise, we do have a home ice cream maker, and get mixed results from it. Mostly it just seems more trouble than it's worth. But this method is easy, and the results are quite good! Can't beat that. :-) Thanks for the comment. HI Uru, great idea to serve this with biscuits (cookies). And I'll bet you're right that it would taste like pumpkin pie! Thanks for the comment. I probably shouldn't have this ice cream recipe in the 'recipe box'. I love pumpkin ice cream and this waaaaaaaaaaaaaay too easy-----and I have an ice cream maker. Now what is this brain washing idea because it's extra rich, we will less? Get real! That makes it extra good and thus will probably eat more. To be honest I discovered in a buffet a few years ago, if I eat dessert first I actually do eat surprisingly way less food. Great ice cream recipe for sure. Oh forgot----I did go over to Hotly Spiced. Sweet that she chose one of your recipes. I have often made no churn ice cream and this one needs to be tried right away its looking fabulous and perfect. I live in Poland and I've never tried pumpkin ice-cream! I'm moving to NY soon so I hope to find one there. Your recipe sounds delicious though! That is seriously the perfect scoop of ice cream. It is making my mouth water! Hi Kumar, it does indeed sing sweet autumn. :-) Great line. Thanks for the comment. Hi Carol, you'll be tempted to eat more, and maybe you actually will. We sometimes do! But really, most of the time it fills you up. ;-) Thanks for the comment. That was so nice of Charlie, wasn't it? Hi Taruna, isn't no churn ice cream great? And this one is indeed fabulous and perfect. :D Thanks for the comment. Hi Marcela, NY is great -- you'll enjoy it. 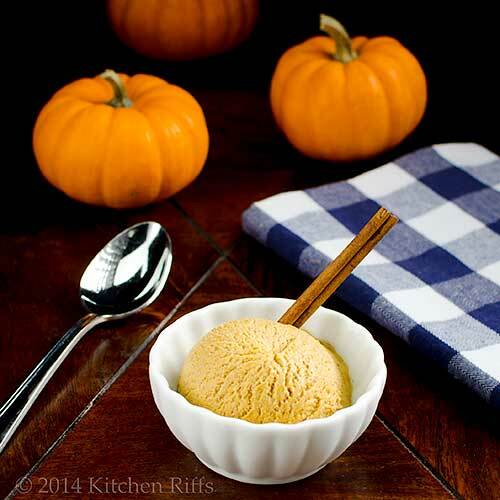 Hope you have a chance to try pumpkin ice cream! Thanks for the comment. Hi Laura, making people's mouths water is what we're all about! :D Thanks for the comment. What a lovely ice cream! And I love the idea you suggested, of adding "crust" in. Sounds wonderful. Hi Beth, the crust is kind of interesting, isn't it? Although it's awfully good without it! Thanks for the comment. Hi Dedy, now you can recreate your childhood favorite! Or at least one that's in the same ballpark, flavorwise. ;-) Thanks for the comment. This sounds fabulous. As you know, I love everything pumpkin except for pie. I know, it's crazy. Pumpkin ice cream, on the other hand, is one of my favorite indulgences at this time of year. The fact that you don't need an ice cream maker makes it all the easier -- and more tempting to make again and again. Hi Carolyn, we really like the no-churn method -- pulling out the ice cream maker was too much trouble, but this is simple and fast. And the pumpkin flavor of this one is outstanding! Really good stuff. ;-) Thanks for the comment. All the while I thought I've seen all the pumpkin recipes this month. And now this pumpkin ice cream! A real yum, John! Love it!!! I love an ice-cream that doesn't require an ice-cream machine. Need to make this, looks so good especially with the condensed milk. I am not much of a pumpkin girl, but I have always loved pumpkin ice cream since trying it at Baskin Robbins many years ago. Thanks to you it looks like I finally have a delicious and easy recipe. Hi Julie, there certainly have been a lot of pumpkin recipes on blogs the last few weeks, haven't there? And of course we have to join the fun! Thanks for the comment. Hi Honey, condensed milk probably isn't used as much as it could be -- it has some interesting characteristics. And it's perfect in this ice cream! Thanks for the comment. Hi Nami, this really is so nice for the season. And this ice cream is so easy to make! Plus it's really, really good. :-) Thanks for the comment. Hi Karen, this really is a top notch recipe, and quite easy to make. It's good stuff! ;-) Thanks for the comment. Fantastic, John! I've made vanilla and chocolate no-churn ice cream with sweetened condensed milk before but LOVE yours with pumpkin and will make many batches this fall. We love our ice cream around here! Thank you so much for sharing. And I always appreciate your chats with Mrs. K R! Hi Hannah, no-churn ice cream just works, doesn't it? And pumpkin is superb in it! Good texture, really great flavor. Hope you enjoy! Thanks for the comment. I made ice cream yesterday, but the old fashion way. This sounds great and so easy!! Hi Chris, ever since we've discovered the no-churn method, we haven't been using our ice cream machine. This is so easy! And the quality is quite good. Thanks for the comment. Hi Lea Ann, this really is incredible ice cream -- we love it! And I'll bet you (and your friends!) will too. :-) Thanks for the comment. Hi Greg, you're right -- it is easier than pie! :-) Thanks for the comment. I have an ice cream maker so have never tried a no-churn method. But this is too delectable too pas up. Love the idea of the spicing and heating of the pumpkin mixture. I have been trying different pumpkin dessert this season (why limit all to pumpkin pie) so will have to try this. When people are over. To help me eat it. (Husband and I have no restraint when it comes to ice cream! Doubt that we could restrain from finishing the quart ourselves! Hi Claudia, we mainly make ice cream when we're having company for exactly the same reason. :-) And if you don't have people over, you will end up finishing off the quart of this in record time! Thanks for the comment. This is the perfect use for pumpkin if you ask me. I love your no churn recipe too! Great idea! 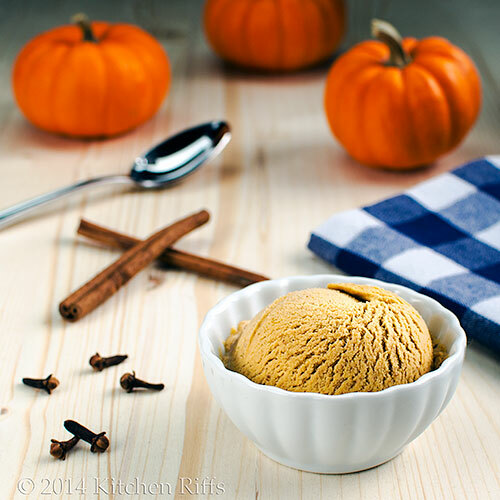 My husband doesn't think it can be Thanksgiving without pumpkin pie…I believe he would love this ice cream. Hi Kristi, isn't the no-churn recipe great? Easy, and so much fun to play with! Thanks for the comment. Hi Karen, maybe you should serve Thanksgiving pumpkin pie with a scoop of this on top. :-) Might be too much of a good thing, though! Thanks for the comment. That is such a wonderful idea and delicious fall dessert! I always love a no-churn recipe because everyone can make it. This looks really delish! Hi Rosa, isn't this a nice ice cream? So easy, and a wonderful flavor! Thanks for the comment. Hi Peachy, no-churn ice cream really is good stuff! Easy and totally delish. ;-) Thanks for the comment. We're having a warm October down here, so a fall-inspired ice cream sounds perfect today! I'm such a fan of pumpkin, I might need to try some pumpkin ice cream on top of a piece of pumpkin pie. Hi Raymund, it really is great ice cream -- wonderful texture and flavor! Thanks for the comment. Hi Lisa, we eat ice cream throughout the year. :-) And this on pumpkin pie sounds delish! Thanks for the comment. Hi Merryn, pumpkin ice cream is such tasty stuff! Really a fun flavor. Thanks for the comment. I love no churn ice cream recipes. I have never thought of using pumpkin in ice cream, this sound delicious. Great recipe! Hi Dawn, no churn is the easiest way ever to make ice cream! And it's really good, too. :-) Thanks for the comment. Hi Dawn, pumpkin works really well in ice cream! Great flavor, of course, but it also gives it such a nice texture. Thanks for the comment. Any ice cream without churning has my stamp of approval. This looks so delicious, John. Hi Kiran, no-churn is the way to go! Really easy, and really good. :-) Thanks for the comment. Gorgeous recipe and gorgeous clicks! Love it! Whoopee! Pumpkin pie ice cream is my favourite. I usually make mine with traditional crème anglaise (milk and eggs cooked to a custard state) but your method looks easier. I always say that I could eat an entire pumpkin pie in one sitting- I'm afraid I can now say the same about pumpkin pie ice cream (I'd better loosen the waistline of my pants)! Hi Asmita, isn't this nice? The flavor is wonderful! Thanks for the comment. Hi Fran, I'll bet the crème anglaise method would have a richer flavor, but this is much easier. And the flavor really is excellent. Thanks for the comment. In my opinion, ice cream is an all season treat and why not add some pumpkin to make it a fall dessert? I've really got to try this recipe. Another great post, John! Hi Bill, although we probably eat more ice cream in warm weather, we certainly have our share (OK, more than our share!) during the rest of the year, too. This really is a good recipe -- hope you enjoy. Thanks for the comment. John, this looks so rich and creamy and I know it must taste just like a delicious pumpkin pie in a cooling desert. I would love at least 3 scoops please. Ice cream recipes are always a problem for me as I do not have an ice cream maker but I don't need one for you recipe so I am delighted. I can't wait to try this recipe. Just shared! Why doesn't my no churn mango icecream NEVER look as good as your icecream!!! It tastes good, but I can never take a such a great photo of icecream like you have done!! So yes, basically that's me complimenting you first on a GREAT photo. And what a great concept to make a pumpkin icecream. wonderful for this time of the year. Hi Bam, 3 scoops coming up! Your boys are rubbing off on you. :-) We do have an ice cream maker, but honestly, the texture of the ice cream we get is only so-so. Probably it's us. Anyway, this method works really well! Thanks for the comment. Hi Ansh, ice cream is tough to photograph! Among other things, it melts. :-) The pumpkin in this ice cream helps keep the ice cream just a little bit soft (still frozen quite hard, but it has some give to it), so it's really easy to scoop. Thanks for the comment. This is an original flavour for an ice cream. Yummy. Hi Marta, this is really good! Worth having for breakfast. :-) Thanks for the comment.